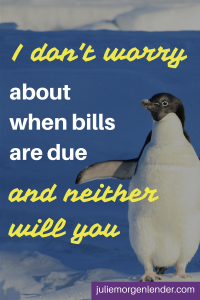 I don’t pay any attention to when bills are due. It’s a luxury I’m thankful for, and one that I’m convinced you can have, too. Here’s how I do it. There are instructions for you to set it up, too. Automatic bill pay is a dream for people like me. I used to get late fees on my credit card bills not because I didn’t have the money to pay them, but because I was a bit unorganized and sometimes paid them a day or two too late. Oops! Sometimes I got the fees waived, but not always. What a costly mistake. I could just kick myself every time, but I kept doing it! Maybe for you the issue is bills coming due before your next paycheck. This works just as well for that situation, too. For any monthly bill you have, even if the date or amount varies from month to month (like the electric bill) you can probably set up automatic payments. Over the years I have set up Electricity, gas, cell phone, gym membership, credit cards, and more to be paid automatically from my bank account or by credit card. Voila! No more worry about due dates! Setting up automatic payments is great, but you still need to have the money available to pay those bills. Point all of those payments at a single bank account and/or credit card. If you use a credit card for this, be sure it is used only for these necessary monthly bills and that it gets paid from that same bank account. Then put money in the account. This bank account is your bill paying account, only used for these recurring monthly bills. Start out with enough in the bill paying account to cover a month’s worth of these necessary expenses. The amount varies, of course, so aim high. Then add a bit. Look over your expenses from the past year to figure this out. If you usually spend $1500-$2000 and you average $1800, then start with $2500 in the account, just to be safe. This is your cushion. This is what allows you to not worry if several bills are paid from the account before your next deposit. Now you will add to this account every month. After all, you’re spending money from it every month. Split your paychecks. Have part of each paycheck go to your various nest eggs – your retirement fund, your new car account, your travel account, and so on like you usually do. But first, have part of your paycheck go to your bill paying account. In this case, if you get paid biweekly then you will put $900 from each paycheck into this account. Necessary expenses that are paid irregularly are harder, but thanks to your tracking, you know how much you average on things like groceries and gas and you have already added that to your bill paying account. And since you’re reviewing your finances regularly, you will know if something changes (like a big grocery bill because you have 40 people over for Thanksgiving dinner) that requires transferring a bit more cash to your bill paying account. As for your other expenses, those are coming from another account. From every paycheck you first put enough money in your bill paying account to cover rent, utilities, food, and other monthly bills. Then you put money into your various nest eggs. What’s left over is what you’ll use to go to the movies, eat out, and buy a new pair of shoes. By keeping that money separate, you never have to worry about accidentally spending the rent money on pad thai. I don’t just tell my clients to review their money situation monthly; I do it, too. Spending just one hour per month I have a deep knowledge of my finances, confidence in my status, and a sense of control. Once a month I review my income and all of my bills. I make note of anything that doesn’t look right. Bills are paid automatically, but a human eye needs to catch any errors. If I see my internet bill jump, I call up to negotiate a lower rate. If I see a charge on my credit card that looks suspicious, I call the company to get it removed. These pop up a few times each year, but usually there’s no problem. Part of this monthly review involves looking at bank statements and upcoming credit card charges. It’s obvious if a checking account has too much money and needs some moved into savings, or if it’s running low and needs some more cash. I know if a large purchase is about to paid from my bill paying account, since I’m reviewing my credit card bill a week or more before it’s due and the other bills are consistent amounts. I simply make any needed adjustments. That sounds like a lot, but like I said, it only takes about an hour each month. The rest of the month I don’t think about my bills at all. Not. At. All. Because why should I? The gas company wants money so they take it from my bank account. The cell phone company wants money so they charge my credit card. The credit card company wants money so they take it from my bank account. 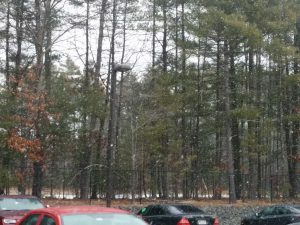 And while all of that is going on, I’m working with clients, browsing Facebook, taking a walk, or glancing out the window at the beautiful falling snow while I’m supposed to be writing a blog post about paying bills. Life is busy and hectic and fun and beautiful and I just don’t want to be distracted by stress about when bills are due. The snow is so beautiful, especially when I’m in a cozy apartment! 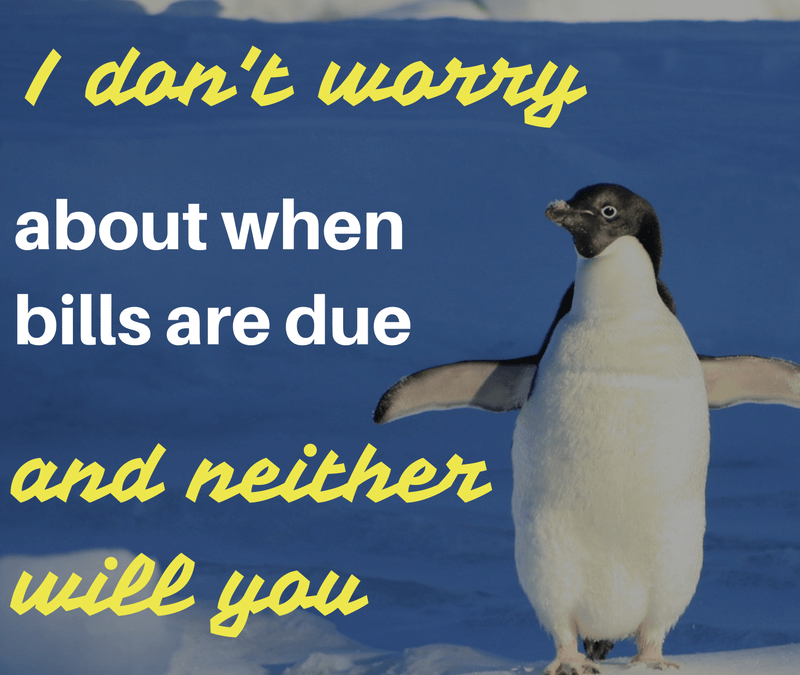 If you’ve never automated your bills before, start small. Repeat these steps every month until you’re fully set up. Choose a current checking account or open a new one for this purpose. This is now your bill paying account. Choose a predictable monthly bill and set up automatic payments to be drawn from that bank account. Put enough money into the bank account to cover that bill. Split your paycheck or set up a repeating transfer from another bank account to your new bill paying account. The amount of this deposit/transfer will be enough to cover the bill you just automated. Notice how freeing it is to have one less bill to pay each month! Enjoy this freedom as it increases with each new bill you add to this plan. Keep these steps handy with your free downloadable pdf and review them for each new bill! Did you catch the added benefit to this approach? It’s subtle but substantial. By following this approach you won’t run out of money before the end of the month! It’s a common worry, but it won’t be yours after today. Because now you see how simple it is. By putting enough money from each paycheck to cover your necessary recurring bills into a separate bill paying account, you can’t possibly run out. Then by reviewing your finances monthly, you don’t have to worry about unfortunate surprises. Now, follow the steps above to set up your bills. It will only take a few minutes. Then go enjoy your stress-free month!